This page contains pictures and information about Stink Bugs in Subfamily Pentatominae that we found in the Brisbane area, Queensland, Australia. We found quite a number of Stink Bug species in Brisbane. Most of them (except 3 in Asopinae and 1 in Podopinae) are sub-family Pentatominae. They are listed as follow. Tribe Antestini - We found two species of this tribe in Brisbane. Bugs in this tribe are usually colourful. Tribe Halyini - The bugs have the shield shape body. They are usually from brown to dark brown in colour, with triangular scutellum. 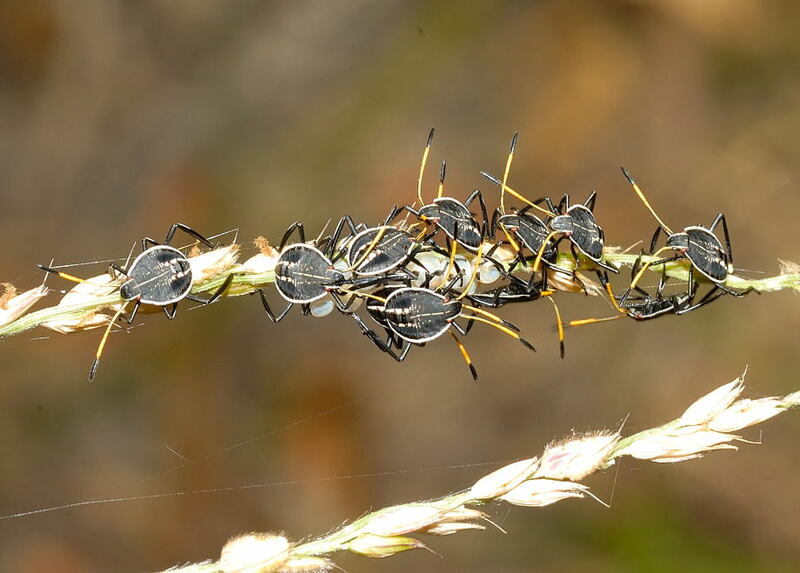 Tribe Carpocorini and Agonoscelidini - The stink bugs in this group are small to medium size, usually with shiny dark colours. Tribe Diemenini and Menidini - They are small to medium in size. The juga sometimes surpass the apex of the anteclypeus. Tribe Nezarini - We found two species of this tribe in Brisbane. They are green in colour. Tribe Rhynchocorini - We found three species of this tribe in Brisbane. All of them have spiny shoulder. Other Stink Bugs - All other stink bugs in subfamily Pentatominae are listed in this page. Or check our Stink Bugs Field Guide. 2. Pentatominae - Australian Biological Resources Study, Department of the Environment and Heritage, Commonwealth of Australia 2005. 3. Plant-feeding and Other Bugs (Hemiptera) of South Australia. Heteroptera – Part I & II - by Gordon F. Gross, South Australian Government Printer, Adelaide, 1975/1976.